The couple’s story, called the Hill Abduction, and occasionally the Zeta Reticuli Incident, was that they had been kidnapped for a short time by a UFO. Theirs was the first widely-publicized claim of alien abduction, adapted into the best-selling 1966 book The Interrupted Journey and the 1975 television movie The UFO Incident. According to a variety of reports given by the Hills, the alleged UFO sighting happened on September 19, 1961, at around 10:30 p.m. The Hills were driving back to Portsmouth from a vacation in Niagara Falls and Montreal, Quebec, Canada. There were only a few other cars on the road as they made their way home to New Hampshire’s seacoast. Just south of Lancaster, New Hampshire, Betty claimed to have observed a bright point of light in the sky that moved from below the moon and the planet Jupiter, upward to the west of the moon. While Barney navigated U.S. Route 3, Betty reasoned that she was observing a falling star, only it moved upward, like a plane or a satellite. Since it moved erratically and grew bigger and brighter, Betty urged Barney to stop the car for a closer look, as well as to walk their dog, Delsey. Barney stopped at a scenic picnic area just south of Twin Mountain. Worried about the presence of bears, Barney retrieved a pistol that he had concealed in the trunk of the car. Betty, through binoculars, observed an “odd shaped” craft flashing multicolored lights travel across the face of the moon. He quickly returned to the car and drove toward Franconia Notch, a narrow, mountainous stretch of the road. The Hills claimed that they continued driving on the isolated road, moving very slowly through Franconia Notch in order to observe the object as it came even closer. At one point the object passed above a restaurant and signal tower on top of Cannon Mountain. It passed over the mountain and came out near the 48′ profile of the Old Man of the Mountain (New Hampshire’s State Symbol). Betty testified that it was at least one and a half times the length of the granite profile and seemed to be rotating. The couple watched as the silent, lighted craft moved erratically and bounced back and forth in the night sky. As they drove along Route 3 through Franconia Notch, they stated that it seemed to be playing a game of cat and mouse with the couple. Approximately one mile south of Indian Head, they said, the object rapidly descended toward their vehicle causing Barney to stop directly in the middle of the highway. The huge, silent craft hovered approximately 80–100 feet above the Hills’ 1957 Chevrolet Bel Air and filled the entire field of the windshield. It reminded Barney of a huge pancake. Carrying his pistol in his pocket, he stepped away from the vehicle and moved closer to the object. Using the binoculars, Barney claimed to have seen about 8 to 11 humanoid figures who were peering out of the craft’s windows, seeming to look at him. In unison, all but one figure moved to what appeared to be a panel on the rear wall of the hallway that encircled the front portion of the craft. The one remaining figure continued to look at Barney and communicated a message telling him to “stay where you are and keep looking.” Red lights on what appeared to be bat-wing fins began to telescope out of the sides of the craft and a long structure descended from the bottom of the craft. The silent craft approached to what Barney estimated was within 50–80 feet overhead and 300 feet away from him. 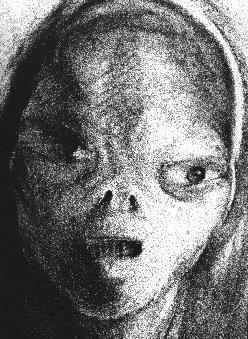 On October 21, 1961, Barney reported to NICAP Investigator Walter Webb, that the “beings were somehow not human”. He saw the object again shift its location to directly above the vehicle. He drove away at high speed, telling Betty to look for the object. She rolled down the window and looked up, but saw only darkness above them, even though it was a bright, starry night. Almost immediately the Hills heard a rhythmic series of beeping or buzzing sounds which they said seemed to bounce off the trunk of their vehicle. The car vibrated and a tingling sensation passed through the Hills’ bodies. Betty touched the metal on the passenger door expecting to feel an electric shock, but felt only the vibration. The Hills said that at this point in time they experienced the onset of an altered state of consciousness that left their minds dulled. A second series of codelike beeping or buzzing sounds returned the couple to full consciousness. They found that they had traveled nearly 35 miles south but had only vague, spotty memories of this section of road. They recalled making a sudden unplanned turn, encountering a roadblock, and observing a fiery orb in the road. Betty also had vivid dreams of being on board a spacecraft. While Barney experienced sicknesses. The two told their stories and some suggested they go under regretion hypnosis. The two found out they were abducted. This case is one of the most famous UFO abduction cases. I always doubt every abduction story… just seems so weird to me. ufo on nasa camera See news article down below. I cut the page out of the paper, and scanned the article. Here is a video from the Nasa archives, ufo anomalies captures on film ! The fabric of the cosmos Watch this video and you will be amazed !